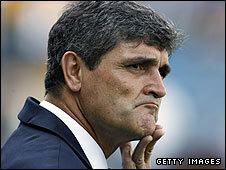 Spurs boss Juande Ramos insists his job is not under threat after the club's worst start to a season for 53 years. But following his side's 2-0 defeat by Portsmouth, which has left them with just two points from six games, Ramos admitted he faces an uncertain future. When asked if he had the confidence of his employers, Ramos said: "Absolutely, we speak regularly and everyone is aware of our delicate position. "But whether I survive is for the chairman and the board to decide." Ramos added: "I'm not hurt (by the fans' abuse). What hurts is not winning matches." Some Spurs supporters were unhappy with Ramos when he substituted Russian striker Roman Pavlyuchenko for Darren Bent after 73 minutes. The move kept the visitors with just one recognised striker on the pitch despite having to chase the game after going 2-0 down, but Ramos defended his decision. "We have been playing with two strikers in most games but we used just one against Newcastle (in the 2-1 Carling Cup win) and it worked better," he said. "Bent had played every minute of the six previous games and needed a break." The pressure on Ramos is certain to increase if his side are eliminated from the Uefa Cup by Wisla Krakow on Thursday. Spurs take a 2-1 lead to Poland but a 1-0 defeat would be enough to see them fall at the first hurdle. "The players know we have another game in another competition on Thursday and we must recover from this very quickly," said Ramos. Former manager Martin Jol led Tottenham to the quarter-finals of the Uefa Cup in 2007 while Ramos, whose Seville team accounted for Spurs on that occasion, guided them to the round of 16 last season. Against Portsmouth on Sunday, Spurs went behind to a Jermain Defoe penalty after Jermaine Jenas's handball. Defoe, whom Ramos deemed surplus to requirements, admitted he had been waiting for the game ever since leaving White Hart Lane in January. Portsmouth manager Harry Redknapp said he was thrilled to have been able to bring Defoe to Fratton Park. 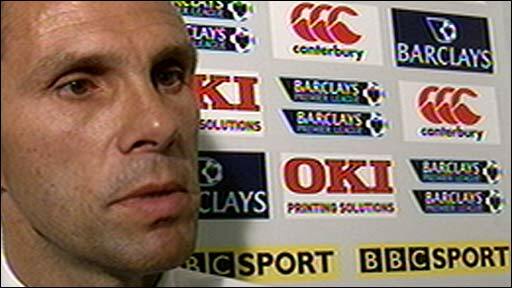 "Tottenham have a top-class manager, who felt he didn't need him," said Redknapp. "I was delighted because we did need him." The visitors were denied a spot-kick when a cross struck Lassana Diarra's arm before ex-Tottenham trainee Peter Crouch headed in for Pompey's second. "We are in a complicated situation and nobody seems to help us when we need it," said Ramos. "Portsmouth scored from a penalty today but in the same kind of incident we were denied a penalty - the same as against Wigan last week. "In critical moments we are not getting these decisions."